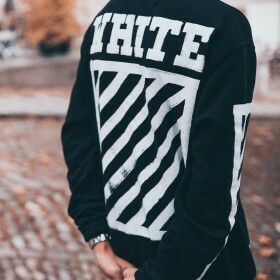 Long sleeve French terry sweater in natural off-white. Crewneck collar. Dropped shoulders. Tonal stitching. Fashiola favorites: Discover the collection of men’s sweatshirts from Gucci, Nordstrom, OFF-WHITE and more which are all available on Fashiola! Searching for something that will never go out of fashion? Well, you’ve found it with men’s sweatshirts. One of the easiest pieces of clothing to style, you can wear a sweatshirt in every situation. You can wear a sweatshirt with a pair of straight leg jeans for a casual look this Fall and if you need the look to more suitable for work, just wear a sweatshirt over a white shirt with the collar poking out. The outfit opportunities are endless; invest in a new sweatshirt today.